Back in March Rihanna debuted a new cross tattoo. In the photo she is wearing black Ray Ban Wayfarers and a grey v-neck tee. 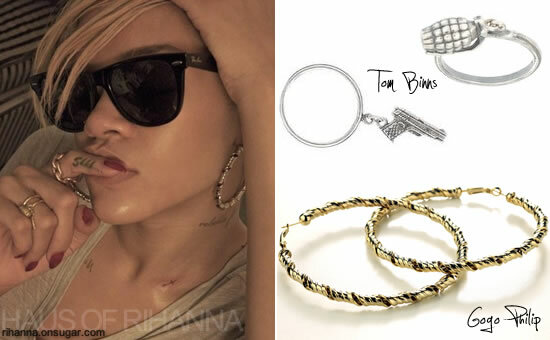 Her jewellery includes gold hoop earrings by designer Gogo Philip and Jennifer Fisher‘s XL Chainlink Ring in rose gold. She also wore two gold rings from Amo by Tom Binns – the Gun Ring and the Many Happy Returns grenade ring. Asos still has two rings from the Amo collection and they’re both on sale! You can get the Bomb Ring and Many Happy Returns in silver.